11-30-2018 CMS sets New Jersey and Wisconsin pass-through funding for 2019. New Jersey was lately notified by CMS that the state will receive $180.2 million in pass-through funding for its newly approved reinsurance program, a drop from the requested $218 million as part of its waiver application and approval. CMS also notified Wisconsin that the state would receive $127.7 million in pass-through funding for reinsurance in the 2019 calendar year, after initial estimates of $166 million in funding were included in the state's waiver application. 11-30-2018 CMS sets Maine and Maryland pass-through funding for 2019. CMS notified Maine that the state would receive $65.3 million in pass-through funding for reinsurance in calendar year 2019, an increase from the $59.6 million the state was estimated to receive upon waiver approval in July 2018. 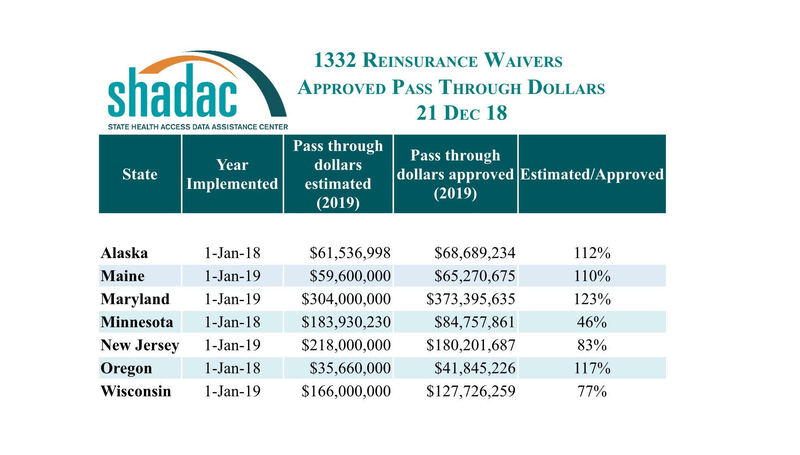 Maryland is set to receive $373.4 million in pass-through funding for its 2019 year reinsurance program, nearly $70 million more than the $304 million it was approximated to receive as of its waiver approval in August 2018. 11-30-2018 CMS sets Alaska, Minnesota, and Oregon pass-through funding for 2019. CMS notified Alaska that the state would receive an estimated $68.7 million in pass-through funding for reinsurance in the 2019 calendar year. CMS had initially determined that Alaska would receive $61.5 million in pass-through funding for the state’s reinsurance program. Minnesota was also recently notified that it will receive approximately $84.7 million in pass-funding for calendar year 2019, a sizeable drop from the inital CMS estimate of $183.9 million. Oregon will receive $41.8 million in pass-through funding for its reinsurance program, roughly $6 million more than the $35.7 million it was set to receive as of its waiver approval. 8-22-2018 CMS approves Maryland’s 1332 Waiver application. CMS approved Maryland’s 1332 Waiver application seeking federal approval and pass-through funding for the state’s proposed reinsurance program. Maryland’s reinsurance program targets a 30% reduction in premiums and is funded by a 2.75% assessment on most health insurance plans and Medicaid managed care organizations in addition to federal pass-through funding. 8-16-2018 CMS approves New Jersey’s 1332 Waiver application. After just over one month of review, CMS approved New Jersey’s 1332 Waiver application seeking approval for its reinsurance program. New Jersey’s reinsurance program targets a 15% reduction in premiums for 2019. The reinsurance program is funded in part by penalties collected under New Jersey’s state-level individual insurance coverage mandate. CMS will determine pass-through funding amounts for the reinsurance program by the end of October 2018. 7-30-2018 CMS approves Maine’s 1332 Waiver application. CMS approved Maine’s 1332 Waiver application that sought federal approval for its state-based reinsurance program. The agency took less than two months to review and approve the waiver since determining it was complete the first week of June. As with Wisconsin, the amount of pass-through funding for the reinsurance program will be determined by the end of October 2018. 7-29-2018 CMS approves Wisconsin’s 1332 Waiver application. After less than three months of review, CMS approved Wisconsin’s 1332 Waiver application seeking approval for its state-based reinsurance program. The approval letter specifies that the amount of pass-through funding will be determined by CMS by the end of October 2018. 7-13-2018 CMS determines New Jersey’s Waiver application complete. After reviewing New Jersey’s 1332 waiver application, CMS determined that the states application was complete. CMS has 180 days to approve New Jersey’s Wavier. 7-5-2018 CMS determines Maryland’s Waiver application complete. After a review of Maryland’s 1332 waiver application, CMS determined that the state’s application was complete. This determination marks the start of the required 180-day decision-making period, which gives the agency until January 2019 to approve or deny Maryland’s waiver request. 7-2-2018 New Jersey submits final 1332 Waiver application. New Jersey’s Department of Banking and Insurance submitted the state’s 1332 Waiver application for approval and funding for a state-based reinsurance program. The program targets a 15% reduction in premiums. New Jersey set a corridor of $40,000 ­– $215,000 with a reinsurance rate of 60% / 40%. The state anticipates a net federal savings of $218 million in 2019 and will provide an additional $105.8 million in state funding for 2019. 6-8-2018 CMS determines Maine’s Waiver application complete. After reviewing Maine’s 1332 Waiver application, CMS made a preliminary determination that the state’s Waiver application was complete. This determination of completeness marks the beginning of the 180-day Federal decision-making period, giving CMS until approximately December 2018 to approve Maine’s application. 5-31-2018 New Jersey releases Draft 1332 Waiver application. New Jersey’s Department of Banking and Insurance released a Draft 1332 Waiver application seeking Federal approval and pass-through funding for a state-based reinsurance program. Per the Waiver application’s authorizing legislation, the state is targeting a 10–20 percent reduction in 2019 premiums. In addition to pass-through funding, the reinsurance program will be funded by penalties collected under New Jersey’s state individual health insurance coverage mandate. The program’s proposed coinsurance rates, reinsurance corridors, and a pass-through funding request amount are to-be-determined based on forthcoming actuarial analysis. 5-31-2018 Maryland submits 1332 Waiver application. Maryland submitted its 1332 Waiver application to CMS. The application seeks approval for a state reinsurance program along with pass-through funding. Maryland expects the program to reduce 2019 premiums by 30 percent and will be funded by a 2.75% assessment on health insurance premiums in addition to federal pass-through funding. 5-9-2018 Maine submits 1332 Waiver application. Maine submitted its 1332 Waiver application to CMS, seeking approval and pass-through funding for its proposed reinsurance program, the Maine Guaranteed Access Reinsurance Association (MGARA). The state expects MGARA to result in a nine percent net decrease in 2019 premiums. 5-9-2018 CMS determines Wisconsin’s Waiver application complete. After reviewing Wisconsin’s 1332 Waiver application, CMS made a preliminary determination that the state’s Waiver application was complete. This determination of completeness marks the beginning of the 180-day Federal decision-making period, giving CMS until approximately November 2018 to approve Wisconsin’s application. 4-20-2018 Maryland releases Draft 1332 Waiver application seeking approval for reinsurance program. The Maryland Health Benefit Exchange, the state’s ACA Marketplace released a Draft 1332 Waiver application seeking federal approval of and pass-through funding for a traditional, state-based reinsurance program. The proposed reinsurance program has a cap of $250,000 with an 80 percent coinsurance rate; the attachment point is to be determined based on stakeholder feedback. For 2019, Maryland is seeking $97 million in pass-through funding in addition to $365 million in state funding provided by a 2.75% assessment on Maryland health plans and Medicaid MCOs based on annual net premiums. The state anticipates that the program will reduce 2019 individual market premiums by approximately 30 percent. 4-18-2018 Wisconsin submits 1332 Waiver Application to CMS. Wisconsin submitted its 1332 Waiver Application to CMS for approval. The state is seeking $166 million in pass-through funding with the remainder of the funding for the $200 million program coming from Wisconsin’s general fund. The state expects the program to decrease 2019 premiums by 10.6% relative to baseline (a 5.4% decrease from 2018) and increase individual market enrollment by 0.8%. The state is proposing a 50% coinsurance rate for 2019, though the coinsurance rate could be set between 50% and 80% in subsequent years, as allowed by statute. 4-9-2018 Louisiana releases Draft 1332 Waiver Application seeking approval for reinsurance program. Louisiana’s Department of Insurance released a detailed description of its proposed 1332 Waiver Application seeking federal approval for a state-based reinsurance program, the Louisiana Health Reinsurance Association (LHRA). Louisiana is seeking $103.5 million in federal pass-through funding for 2019 in addition to $24.8 million in state funding coming from a proposed per-member assessment on Louisiana health insurers. The state has yet to determine the assessment rate, reinsurance corridor, and coinsurance rate. 4-2-2018 Maine releases Draft 1332 Waiver Application to reinstate its condition-specific reinsurance program. Maine released actuarial analysis and a summary of it's draft 1332 Waiver Application, seeking approval to reinstate its pre-ACA reinsurance program, Maine Guaranteed Access Reinsurance Association (MGARA) along with $35 million in federal pass-through funding for 2019 to complement $59.6 million in state funding. MGARA is a condition-specific reinsurance program that automatically pays a portion of claims in a specific corridor ($47,000 – $77,000) for covered individuals with one or more of eight specified health conditions or on a voluntary basis for other covered members with claims in the corridor. The state estimates that reinstating MGARA would reduce 2019 individual market premiums by about 9% relative to what they would be without the program. 3-13-2018 Wisconsin releases Draft 1332 Waiver Application. Wisconsin released a draft of its 1332 Waiver Application, seeking $170 million in federal pass-through funding for its state reinsurance program, the Wisconsin Healthcare Stability Plan (WIHSP). The state anticipates that if approved, WIHSP would reduce 2019 individual market premiums by 10% relative to premiums if the plan were not approved. 2-6-2018 CMS sets Alaska and Oregon pass-through funding for 2018. CMS notified Alaska that the state would receive an estimated $58.5 million in pass-through funding for reinsurance in the 2018 calendar year. CMS had initially determined that Alaska would receive $48.3 million in pass-through funding for the state’s reinsurance program. Oregon will receive $54.5 million in pass-through funding for its reinsurance program, nearly $19 million more than the $35.7 million it was set to receive as of its waiver approval. 1-26-2018 CMS sets Minnesota pass-through funding for 2018. CMS notified Minnesota that the state would receive an estimated $130.7 million in pass-through funding for the state’s reinsurance program in calendar year 2018. This was $8.5 million less than the $139.2 million specified in CMS’s initial waiver approval. 11- 2017 Idaho released its draft 1332 and 1115 Waiver Applications. Idaho released draft 1332 and 1115 Waiver Applications for public comment. The proposed program is a novel combination of a new Medicaid eligibility category for individuals below 400% FPL with complex medical conditions; a state-funded, condition-specific individual market high-risk pool; and extending individual-market premium tax credits and cost-sharing reductions to individuals below 100% FPL. The state projects that their proposal will cover an additional 21,000 individuals while reducing total federal expenditures by $2 million. 10-23-17 Iowa withdrew its 1332 Waiver Application. Iowa’s Insurance Commissioner Doug Ommen withdrew the state’s 1332 Waiver Application, citing overly restrictive 1332 Waiver requirements that prevented the state from implementing its Stopgap plan under terms that would be workable for the state. 10-19-17 CMS provided Iowa guidance on funding for its 1332 Waiver Application. CMS responded to Iowa’s 1332 Waiver application, giving the state guidance on how and when pass-through funding amounts would be calculated. In its letter to Iowa, CMS stated that could only pass through the amount of funding that CMS would have provided in subsidies had Iowa not implemented its 1332 waiver. Because the amount of pass-through funding Iowa requested was larger than the amount that Iowans would have otherwise received in subsidies, the state would have needed to make up the difference in state-only funding in order to make its waiver federal deficit neutral. 10-19-17 CMS approved Oregon’s 1332 Waiver. CMS has approved Oregon’s 1332 Waiver Application. The waiver Specific Terms and Conditions (STC) state that the state will receive pass-through funding for its reinsurance program but do not list a specific amount of funding. CMS will specify the amount of available pass-through funding no later than December 30, 2017, as long as the state provides CMS with the necessary information to calculate pass-through funding by November 14, 2017. 10-16-17 Minnesota accepted 1332 Waiver terms. Minnesota Governor, Mark Dayton officially accepted the Specific Terms and Conditions for the state’s 1332 Waiver, though he reasserted his strong disagreement with CMS’s interpretation of federal law that led to its decision to not pass through federal savings on funding for the state’s Basic Health Plan (BHP), MinnesotaCare. Gov. Dayton specified that in signing the STCs, he was not waiving Minnesota’s right to the full amount of its federal BHP funding based on the state’s argument outlined in an October 4 memo to CMS. 9-29-17 Oklahoma withdrew its 1332 Waiver Application. Oklahoma notified CMS that it was withdrawing its 1332 Waiver Application. Oklahoma blamed CMS for missing a mutually-agreed-upon September 25 deadline for approval necessary for the state to implement its reinsurance program before the 2018 plan year. CMS had previously determined the application to be complete and indicated that approval would be forthcoming by the September 25 deadline. The state plans to seek a 1332 Waiver for reinsurance in future years. 9-22-17 CMS approved Minnesota’s 1332 Waiver. CMS has approved Minnesota’s 1332 Waiver Application, giving the state $139 million in pass-through funding for reinsurance in 2018, and a total of $1 billion in funding over five years. This is the amount the federal government will save in premium tax credits and cost-sharing reduction payments due to Minnesota’s reinsurance program. However, as Gov. Mark Dayton anticipated in a September 19 letter to Secretary Price, CMS will not pass through the money it will save on funding for the state’s Basic Health Program (BHP), MinnesotaCare since BHP funding is based on 95% of the amount of premium tax credits and cost-sharing reductions that would have been provided to BHP enrollees. Though CMS does not specify how much funding the state will lose for MinnesotaCare, Gov. Dayton claims that the state would lose $369 million in BHP funding over two years, more than it would gain in pass-through funding for reinsurance. The state has 30 days from receipt of the approval letter to accept or reject the terms of approval. 9-17-17 Iowa submitted an amendment to its 1332 Waiver. Iowa provided a supplement to its 1332 Iowa Stopgap Measure to increase the cost sharing subsidies available to individuals with incomes between 133–150% FPL. The state expects that the additional subsidy will increase participation of young, healthy individuals in its individual market, improving the risk pool and keeping premiums down. Because of this improved risk pool, the state is decreasing its reinsurance pass-through funding request from $80 million to $70 million. 8-31-17 Oregon submitted its 1332 Waiver Application. Oregon’s waiver seeks pass-through funding for its reinsurance proposal. $90 million in annual state funding for reinsurance plan is paid for through a 0.3% assessment levied on major medical premiums and through excess fund balances in two state programs. The state is seeking more than $30 million annually in federal pass-through funding. The reinsurance plan has a coinsurance rate of 50% and a cap of $1 million. The attachment point is to be determined. 8-16-17 Oklahoma submitted its 1332 Waiver Application. The Department of Health and Human Services submitted Oklahoma’s 1332 waiver, the Individual Health Insurance Market Stabilization Program (OMSP). The OMSP will have a broad corridor of $15,000 – $400,000 and will be largely funded with federal pass-through funding, with a smaller portion coming from a state assessment on health insurers. 8-1-17 Minnesota released preliminary individual market premiums. The Minnesota Department of Commerce published anticipated premium increases by health plans with and without reinsurance. With state reinsurance, plans expect that 2018 premiums could be modestly higher (largest increase 11.4%) to substantially lower (largest decrease 40.8%) than 2017 premiums. Without state reinsurance, plans project much larger increases in 2018 premiums. 7-19-17 New Hampshire released its Draft 1332 Waiver Application. The New Hampshire Department of Insurance released a draft of its 1332 Waiver application for public comment. The waiver proposes a traditional reinsurance program with a corridor of $45,000 – $250,000 and a 40% / 60% coinsurance rate. The application seeks $12.8 million in federal pass-through funding. 7-14-17 Oklahoma released its Draft 1332 Waiver Application. The Oklahoma Department of Insurance released a draft of its 1332 Waiver Application for public comment. Oklahoma’s 1332 waiver proposal includes reinsurance along with broader reforms to its individual market. The state is awaiting further actuarial analysis before determining its reinsurance plan’s corridor, coinsurance rate, and level of pass-through funding. Oklahoma’s proposal is a traditional reinsurance plan funded by assessments on health insurers. 7-7-17 CMS approved Alaska’s 1332 Waiver Application. CMS notified Alaska that its 1332 Waiver Application had been approved. The state was awarded $48.3 million in federal pass-through funding in 2018, and a total of $322 million over five years.